With Companion Print: Vice-Admiral Graf von Spee's flagship, the 11,400 ton armoured cruiser Scharnhorst seen with the light cruiser Nurnberg, off the coast of Chile after the German Squadron's victory at Coronal, November 1914. Overall print size: 23 3/8" x 17"
At the outbreak of World War I, Germany's East Asiatic squadron, consisting of two large armoured cruisers and three light cruisers under the command of Vice Admiral Graf Spee, travelled from their base at Tsingtao in northern China, across the western Pacific to the coast of Chile. On 1st November they were intercepted off the Chilean port of Coronel by a British squadron where, enjoying a large advantage in firepower, the encounter ended with a resounding victory for Admiral Graf Spee. The British Admiralty reacted swiftly, despatching a powerful naval force to the South Atlantic to confront the German squadron, and on 9th December battle commenced some 120 miles south west of the Falkiand Islands. Outnumbered, outgunned, and outpaced by the British force, the Battle of the Falklands was over by nightfall. Von Spee and the entire crew of his flagship Scharnhorst perished, and with Leipzig, Nurnberg and Gneisenau also sunk, the East Asiatic Squadron was routed. Only Dresden escaped and when she was scuttled in Chilean waters four months later, the East Asiatic Squadron ceased to exist. 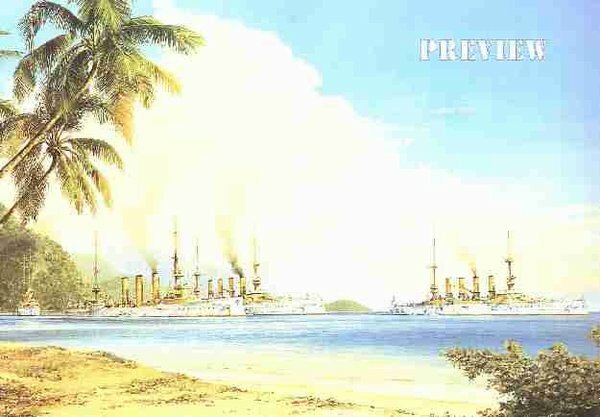 Robert Taylor's stunning painting shows ships of the East Asiatic Squadron at anchor in a Pacific island bay prior to the outbreak of hostilities in 1914. The ships are, left to right, the light cruisers Nurnberg and Dresden, cruiser Gneisenau, and von Spee's flagship Scharnhorst. This spectacular, full size limited edition print, signed and numbered by the artist, is an image that will attract admiration and corrunent whether hung in the home, office, boardroom, or on board ship. A truly wonderful collector print. 500 L/E prints signed by the artist US $195, 50 artist's proofs $350, 25 remarques $600.